Not in Thailand? 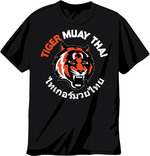 Need a new Tiger Muay Thai Shirt? Now you can pick up your official Six Deuce sponsored Tiger Muay Thai and MMA training camp, Phuket, Thailand clothing T-shirt online. The popular Mixed Martial Arts and Urban Clothing company has developed a great relationship with Tiger Muay Thai, sponsoring several of the elite fighters who have trained out of the facility. Support the companies supporting those in the sport and pick up a TMT Shirt from Six Deuce today.